The approximately 25 charter members were from three counties in Arizona and one county in New Mexico. Currently the club operates several repeater stations from Heliograph Peak. Heliograph is located south of Safford, Arizona at an elevation of 10,028 amsl. 146.90 PL 141.3 is the original repeater sponsored by EAARS. We also have a UHF repeater on 447.825 PL 141.3 and 100.0. These repeaters are not tied into the EAARS network. Click below link for information regarding the EAARS Network system of linked repeaters. Also on Heliograph Peak, there is a APRS radio on 144.39,the National APRS channel. Visitors to the area are welcome to use the open repeaters. Callsign database plus links to trains, train pictures, firearms links, and etc. 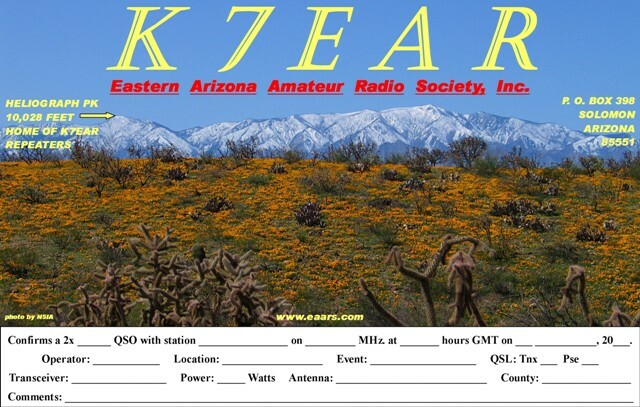 Eastern Arizona Amateur Radio Society, Inc.